“Shaken baby syndrome” or “battered baby syndrome” is a form of inflicted head trauma, which is usually caused by blows to the head, dropping, shaking, or throwing a child. Head trauma is one of the highest causes of deaths in child abuse cases around the world. However, abusive head trauma is not only the results of child abuse, but also due to happiness and joy of parents and surrounding families who acquired long-wanted babies. Because of joy, parents try to be happy lifting their baby up and want to see their baby smile and shout. After playing with their baby, and when the baby rest, parents may notice something is going wrong with the baby. In the beginning, the baby usually cries more, then the baby will stop crying. At this stage, the brain of the baby is damaged. Although the majority of victims are infants younger than 1 year old, thousands of babies die around the world even at the age of 5 to 7 not knowing the cause. Their death may be caused by shaken baby syndrome, too. Shaken baby syndrome cannot be diagnosed by physical appearance alone but only through CT scan. As seen on the image below, the sides of the brain had deformed. Unlike other forms of inflicted head trauma, abusive head trauma results from injuries caused by shaking a child. Common triggers are frustration, stress, financial problem, or poverty, among parents and caregivers or baby-sitters. 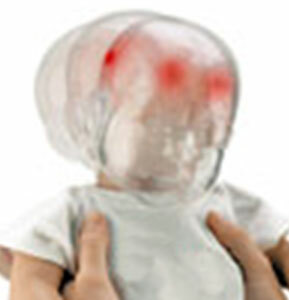 The child's head rotates because the infant's neck muscles are not well developed and provide lack of support for their heads. To avoid this, we do not recommend shaking the baby in any circumstances. Sometimes, shaking baby syndrome may not cause death, but may lead to abnormal growth of the baby.